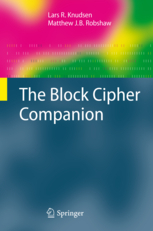 This is a book about block ciphers, written by Lars R. Knudsen and Matt Robshaw. The book is published by Springer, and available elsewhere also e.g., from Amazon and Tesco. All chapters can be downloaded from here . Page 58, 4th last line, "over found encryption rounds" -> "over four encryption rounds". Page 86, 3rd bullet, "If should be hard ..." -> "It should be hard ..."
Page 235, ref 195, "D.W. Davies and S. Murph" -> "D.W. Davies and S. Murphy"
p97, l2: replace the first subscript "(r,i)" by "(r,i-1)"
p97, l15, l16: replace subscripts "(j,s-1)" by "(j,t-1)"
p101, l-4: replace subscript "(r,i)" by "(r,i-1)"
p105, l-6: swap the subscript of the keys: correct is "k_2=i and k_1=j"
p137, Fig.74, 2.f: replace "a_i" by "u_i"
p163, l-3,l-2: replace "encryption" by "decryption"
p166, l8: replace "Dom(h)" by "Dom(f)"
p171, l21: replace subscript "1" by "1,t"
p190, l9: replace subscript "n+m-2" by "m-2" and replace superscript "2n-2" by "n+m-2"